Lightning Cables have typically lacked one thing: ruggedness. You can get a protection case for your iPhone, but it’s hard to find a protection cable. Well, Fuse Chicken has come to our rescue with the Titan, a full length cable Lightning to USB Cable with a tough, but flexible industrial grade steel outer covering. If that wasn’t enough, there’s also a pocket version called the Titan Loop. Fuse Chicken is the Brainchild of inventor Jon Fawcett. The company recently launched a number of heavy duty dock/cable hybrids under the Bobine name. I had the chance to test several of their products during my tenure at Geek Beat and was nothing but impressed. Jon knows how to make a product and these Titans don’t disappoint. The Titan is 1 meter/ 39 inches long. That’s the same listed length as the standard lightning cable, but the longer light and usb connector sheaths make it a little bit longer. The cable has a thick steel outer cover. Its even tougher than it looks and it’s really damn tough looking to begin with. Its the first lightning cable I’ve used where I don’t have to baby it. The titan can be mistreated as much as you want and come back for more. This is an industrial strength cable designed for your gig bag… or your children. What’s even more remarkable is how flexible the Titan is. It’ll go most anywhere your standard and easily breakable lightning cable can. It’s not a special use cable, the Titan can be your everyday cable. The Titan adheres to the Made for iPhone/iPad/iPod (MFi) standards. That means it’s been tested by Apple for compatability. You won’t get that dreaded “cable not supported” error you’ll find in cheap no-name cables. It worked flawlessly both in charging and data. The USB and Lightning connector sheaths are oversized and more rugged, but not as big as you think. The lightning end will work even with protection cases which are notorious for their narrow openings. Fuse Chicken went ahead and made the perfect Lightning Cable. The Titan is available both on Fuse Chicken’s website and Amazon for around $35. When you can get a 1m MFi cable for $10, this is expensive. However, if you keep replacing those $10 cables for frayed ends or broken wires, it adds up. The Titan will last. Its worth the extra money. This is the most rugged cable out there for your iPhone or iPod. its also extremely flexible and fully compatible both electrically and physically with your iDevice and its cases. The $35 isn’t cheap, but if you’re tough on cables, it’s worth the money. Fuse Chicken really out did themselves and made the ultimate lightning cable in the Titan. If you’re a professional and you have a iPad or iPhone in a protection case you need to add this to your gear kit. No issues at all with cases. The Titan Loop is a 9” keychain version of the Titan. Its constructed of exactly the same materials, as many of the same advantages apply. While Fuse Chicken markets this as a keychain cable, I found using it as a keychain to be a little impractical. However, it easily fits in your pocket or purse with only a hint that it’s there. The Loop folds up nice and neat and is just a tad bit longer than other pocket cables like the Kanex GoBuddy+. But it’s a lot tougher and more flexible. What more can I say, the Titan Loop is the Titan only much smaller and more mobile. At $30 their their site and Amazon, the Titan Loop is also pretty pricey, but compared to other pocket cables, the price isn’t all that more expensive. 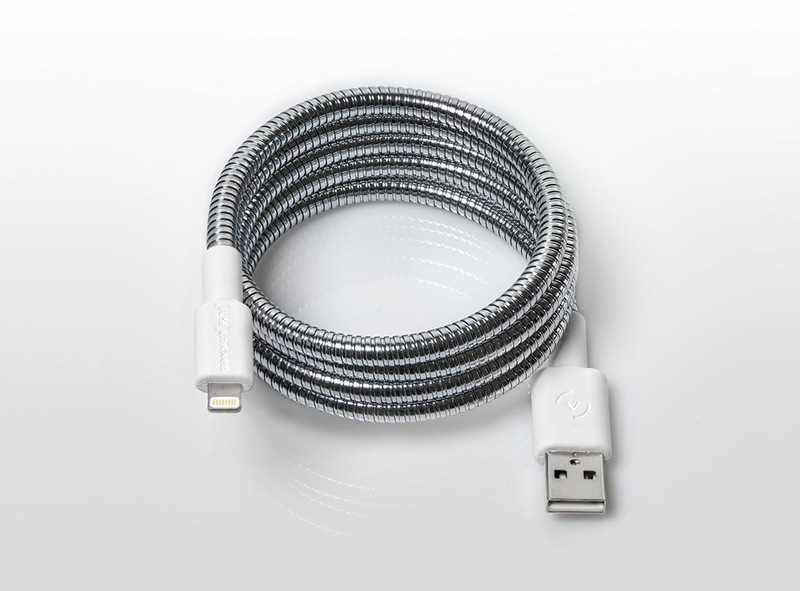 Plus it has the distinction of being the only steel pocket lightning cable I’ve seen. The Titan Loop is a very good pocketable cable, but it’s not that good of a keychain. Its small, its tough, and it’s a bit expensive. If you want a cable that will go everywhere with you and won’t break, the Titan Loop is your best. Next The Tech Hangout’s “Review” of the iOS 9 and OS X 10.11 Betas….